How does it work for a teacher? How much extra time will this take? Why do students improve quicker? Can I try out the student's experience? When you join the Golf Mentor as a teaching professional you have a Dashboard that allows you to guide the student's experience. You should first invite your students to join. At present, your students will receive 10 free days. Before you ask the student to join, you should agree on their goals for the next six months or so. These goals include how many lessons they will have each month. When your student accepts your invitation, they will appear in your Dashboard, with a brief summary of their progress. You can view the goals that you have agreed with them. You can also dig down and view their progress in much more detail. If your student is making good progress, then you can send them a congratulatory message. If the student is not making progress, or you otherwise feel that it is time for them to come for a lesson, then you can send them a reminder that it is time for a lesson. If you are already keeping track of your students using a spreadsheet or pen and paper, this will save you time. If you are not, you need only spend a matter of minutes every week, for a very considerable return. The cost is US$39.99 per month, with a 10 day free trial and no credit card needed. As long as five of your students are platinum members, there is no monthly fee. The student can have a free online handicap that goes up to 99 over par, so it is useful even for beginners. You can set the student goals, so ensuring they will be guided by a clear and achievable aim. They can post practice sessions and games in order to capture key aspects of what you are trying to teach them. They can take a set of scientifically designed challenges, that cover the full swing, approach shots, near the green, and putting. They students have an advanced mental game training. They can analyze their game to identify strengths and weaknesses. Students join as ordinary members of the Golf Mentor as opposed to Pro membership that teaching professionals enjoy. Ordinary members set their goals, make posts about their practice sessions and game, analyze their progress, take challenges, do mental game training and many other activities. They cannot see the posts made by other students nor can they see your dashboard. Can I try out the student experience? You can try out the student experience as a guest user. Note that when you have finished trying out the student experience, you need to click Terminate in the top right menu. You can try the student experience by clicking here. 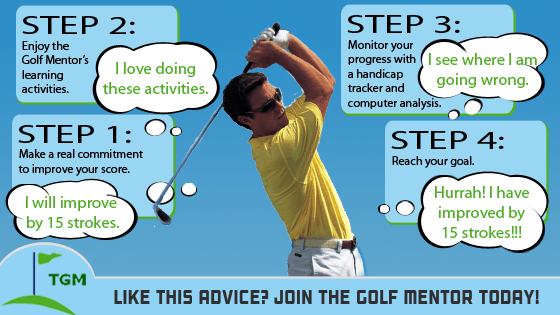 Ready to earn more with The Golf Mentor? Teachers can try The Golf Mentor FREE for 10 days! No credit card needed.